The Swedes of Necrophobic are on their way to the Netherlands and they will not come in peace…By opening one of the (many) gates of Hell, they shall bring forth mayhem and destruction. This particular gate will lead to the Metropool in Hengelo, on the 26th of October. Necrophobic shows that the Swedish melodic black/death metal sound is very much alive and kicking, with their 2018 release Mark of the Necrogram. Ominous, aggressive and catchy as Hell – these veterans know their trade. 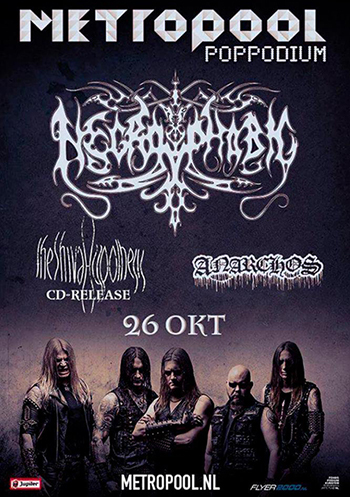 Nothing short of an early-days rebirth, Necrophobic has re-united with Anders Strokirk as vocalist. With both Sebastian Ramstedt and Johan Bergebäck back on the strings, this is promising to be an awesome tour! Looking for some neck-breaking sound? Check out Tsar Bomba below. Progressive and avant-gardistic (local) talent The Shiva Hypthesis will support Necrophobic. Be sure to check them out, as they will present their new album. Anarchos, another local talent, will warm up the respective eyes, ears and beers with their old-school death metal.